It’s time for a change to write in English. Besides, I haven’t been updating my blog since the papal election, and more than a few things have happened after that. Last weeks I’ve been mostly on the road. I finished both pleasant and productive research period at the Finish Institute in Rome, Villa Lante, in the end of April. 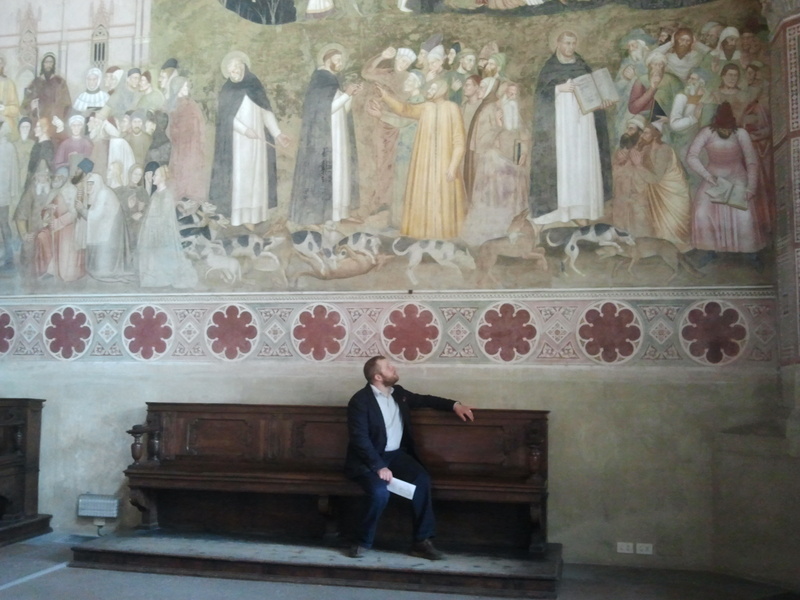 Before the next appointment in Munich at the first week of May I was lucky to have few days off and visit Florence – a city which is a must-see for a student of the later Middle Ages. Amongst all Renaissance splendor I was nonetheless very impressed by the frescoes in the Spanish Chapel of Basilica Santa Maria Novella. Painted in the late fourteenth century and depicting Dominican mission and “Church militant” in the world, they have maybe the most impressive presentation of inquisitors and heretics, portrayed both “in person” as well as symbolically. While the Dominican inquisitors preach to heretics, the dogs attack the wolves, alluding not only to a metaphor of heretics as ravening wolves, but also to a medieval pun of friars preachers as domini canes, the dogs of the Lord. And the road went on: after few days in Munich it was finally time to return home in Wuppertal, but not for too long. This week I had the privilege and pleasure to take part in colloquium on reform and Reformation at the University of Cambridge, St. John’s college. Good discussion, interesting papers and uplifting academic milieu, what more can you hope? Some of my friends have commented that my itinerary resembles that of a medieval scholar. Pretty much so, although some modifications are in order. Rome of course was a goal of pilgrims, envoys and men of learning – as well as Florence, especially during the late Middle Ages. Cambridge has been an academic center since the early thirteenth century, so why not to stop there also. On the other hand back in the days Munich was rather boring and small residence town of Wittelsbacher-family. It had its moments during the reign of emperor Ludwig of Bavaria, who in his conflict with pope John XXII had intellectual backup from men like Marsilius of Padua and William of Ockham (who both died in Munich), but still the real cultural and economic metropolises of medieval Southern Germany were Nuremberg and Augsburg. Wuppertal as such is a creation of 1929, and although its districts have long history, as a medieval traveler I still may have preferred to pay a visit to the relics of Three Kings in nearby Cologne. Of course the greatest difference to medieval travels is not goals but means. Comforts of ICE and the dire challenges of lacking snacks in the airplane have absolutely nothing to do with premodern transportation. 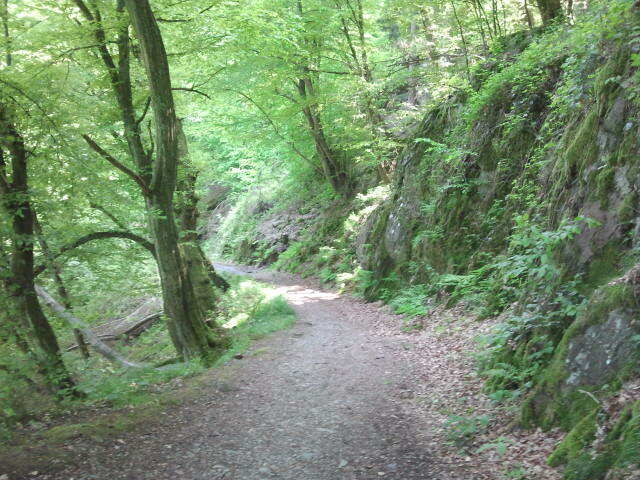 Actually much better equivalent to a medieval trip than my conference tour is a hike we did today. A bit less than 20 kilometers from the monastery church of St. Maria Himmelfahrt to Schloss Burg, the medieval residence of counts (and later dukes) of Berg, local overlords. It’s well conceivable route and distance for a medieval man: I can without too much effort imagine a scribe or priest moving in business between the primary castle of the region and an important monastic foundation. Some parts of the route were in rather pristine condition, so the comparison becomes even more plausible. There of course the similarities end: what for us is leisure, was for a medieval man or woman a necessity and routine. Probably also they encountered riders, but while our fellow travelers on horseback were teenage girls, a medieval peasant or friar probably was at least cautious if not terrified when hearing galloping hoofs on a lonely road. And while strolling on a forest road we have been coached to enjoy the sublimity of sunlight filtering through the foliage, I very much doubt if our medieval forefathers and mothers experienced the same. At least they didn’t write it down, except perhaps in the case when a natural phenomenon had in an authors mind power to symbolize something moral or spiritual. Despite the inescapable distance between experiences of travel it was nevertheless enlightening to spend a day on the paths that even resemble the road network of medieval Europe. If a nearly-twenty-kilometer hike was something that in our opinion had earned us beers in the end, I can’t help but to wonder, what according to a medieval pilgrim was a good days journey. Next: Next post: To Leeds!